Lauren Pennington is celebrating her junior year abroad when life comes to a screeching halt. At Munichâs HofbrÃ¤uhaus, she engages in an innocent flirtation with a charming stranger for the length of a drink. Drink finished, Lauren leavesâonly to be snatched from the streets and thrown into an unmarked van. Officially, Aidan Deveraux is a communications expert for one of the largest financial firms in the world. In his secret life, the former Marine heads the Zermatt Group, a covert team of military and spy agency operatives that search the data stream for troubling events in an increasingly troubled world. When his artificial intelligence system detects Laurenâs kidnapping, Aidan immediately sees the bigger picture. Silicon Valley: Laurenâs father, Vance Pennington, is about to launch a ground-breaking technology with his company NanoUSAâa technology that the Chinese are desperate for. No sooner does Aidan arrive on Vanceâs doorstep to explain the situation than the father receives a chilling text message: hand over the technology or Lauren will be dead in a week. In a globe-spanning chase, from the beer halls of Germany, to the tech gardens of California, to the skyscrapers of China, and finally the farmlands of Croatia, Aidanâs team cracks levels of high-tech security and complex human mystery with a dogged determination. Drawing in teammates from the Forensic Instincts team (introduced in The Girl Who Disappeared Twice), the Zermatt Group will uncover the Chinese businessmen responsible, find the traitors within NanoUSA who are helping them, and save Lauren from a brutal death. Dead in a Week is a spellbinding mystery that I’d recommend to anyone who enjoys a bit of intrigue. With very little foul language, no gore, and a modicum of tension Dead in a Week is a mainstream suspense appropriate for all that still manages to be an intense and intriguing novel that’s difficult to put down! I loved that Ms. Kane pulled characters we know and love, from the forensics instincts series, to introduce us to this new series and set the wheels in motion for an outstanding new collaboration. Dead in a Week wrapped up nicely leaving no untangled strings although… There is a steakhouse I now want to try. Steam: YA || There are just a couple of innuendos and a curse word or two. Normally, Lauren Pennington loved the sound of her combat boots clomping across the cobblestone apron. But right now, all she could think about was the growling of her empty stomach, urging her to move faster. She was oblivious to everything elseâthe couple on the corner sharing a passionate, open-mouthed kiss, the guy puking up his over-consumption of beer into the storm sewer grating, and the man watching her every move as he talked into his cell phone in a language that Lauren wouldnât have recognized had she been paying attention. She walked into HofbrÃ¤uhausâ main hall, took a seat at one of the wooden tables, and placed her order. Minutes later, the waitress came over and brought Laurenâs food and drink. Barely uttering a perfunctory âDanke,â Lauren bit into a pretzel the size of her head and took a healthy gulp of HofbrÃ¤u. HofbrÃ¤uhaus was less than a mile from campus, but the breweryâs main hall had a reputation all its own. With its old-world atmosphere of wooden tables, terra cotta floors, painted arches, and hanging lanterns, how could anyone not feel a sense of history just being within these walls? Maybe thatâs why Europe called out to her, not just here, but from a million different places. Museums. Theaters. Cathedrals. She wanted to experience them all, and then some. Sheâd be going home to San Francisco in July, and she hadnât been to Paris or London or Brussels. Sheâd gotten a mere taste of Munich and had yet to visit Berlin. This year was no different. Laurenâs brother, Andrew, and her sister, Jessica, were both taking time off from their busy careers to join their parents at Tahoeâno easy feat considering Andrew was an intellectual property attorney in Atlanta, and Jess was a corporate buyer for Neiman Marcus in Dallas. Lauren was the only holdout. Lauren. The college kid. The baby. The free spirit who always came home from Pomona College to nest, especially for family gatherings and rituals. Her parents had been very quiet when sheâd told them about her plans. Lauren knew what that silence meant. After the phone call ended, her mother would have cried that she was losing her baby, and her father would have scowled and written off her decision as college rebellion. Neither was true. But no matter how she explained it, her parents didnât understand. Theyâd traveled extensively in Europe, and to them, it was no big deal. But it was Laurenâs first time here, and to her, it was like discovering a whole new worldâa world she felt an instant rapport with. It was like discovering a part of her soul sheâd never known existed. And she had to immerse herself in it. Sheâd entertained the idea of flying to Lake Tahoe for the week and then returning to fulfill her dream. Her parents would definitely pay for that. But given the long international travel, the flight changes, the time differences, and the jet lag, Tahoe would put too much of a crimp in the many plans she had for her break between semesters. Sheâd had invitations from school friends who said she could stay with them during her travelsâfriends from Germany and so many other countries. No, despite how much she loved her family, she had to do things her way this time. Thereâd be other Februarys, other trips to Tahoe. But this was a once-in-a-lifetime opportunity. âSind Sie allein?â he asked, glancing to her right and to her left. The man came around and slid onto the bench seat. He propped his elbow on the table, signalling to the waitress that heâd have the same as the lady. The waitress nodded, hurrying off to get his refreshment. He turned his gaze back to Lauren. âYouâre American,â he noted, speaking English that was heavily accented. âGuilty as charged,â she responded in English. âIs it that obvious?â She gave him a rueful look. âSpeaking of getting lucky, whatâs your name?â he asked. Lauren felt flushed. She was twenty years old. She knew very well what Marko meant by âthe best taste.â She should be offended. But she couldnât help being flattered. He was older, good-looking, and charming. Nonetheless, she wasnât stupid. And she wasnât in the market for a hookup. âThat would be fantastic.â Lauren rummaged in her purse for a pen and paper. Having found them, she set her bag on the floor between them. âAnd once again, Iâm flattered, but no thank you.â Lauren signaled for her check, reaching into her bag and retrieving a twenty euro bill when the waitress approached the table. âThe rest is for you,â she told her. âIâll take care of that,â Marko offered, stopping Lauren by catching her wrist and simultaneously fishing for his wallet. Evidently, he was still holding out hope that she would change her mind. âThatâs okay. Iâve got it.â Lauren wriggled out of his grasp, leaned forward, and completed the transaction. Still smiling, Lauren left the cafÃ© and walked through the wide cobblestone apron outside. There were little tables with umbrellas scattered about, with patrons chatting and eating. Sated by the beer and pretzel, she inhaled happily, and then, walking over to the sidewalk, began what she expected to be a thoughtful stroll. Maybe sheâd text her parents this time, try explaining her position without all the drama of a phone call. “Merr nÃ« makinÃ«,â he said in a language Lauren didnât understand. By this time, Lauren had recovered enough to struggle for her freedom. Her legs flailed in the air, kicking furiously, and she pounded on the manâs back as he carried her and flung her into the back of the van. Marko jumped in behind her, slamming the doors shut and barking out something in the same dialect as the other manâneither French nor Slavicâas the stocky barbarian held her down. Finally finding her voice, Lauren let out a scream, which was quickly muffled by the pressure of Markoâs hand over her mouth. She could taste the wool of the sack, and she inclined her head so she could breathe through her nose. Oh God, she didnât want to die. âShko,â Marko ordered his accomplice, shoving him toward the driverâs seat. Excerpt from Dead In A Week by Andrea Kane. Copyright Â© 2019 by Andrea Kane. Reproduced with permission from Andrea Kane. All rights reserved. 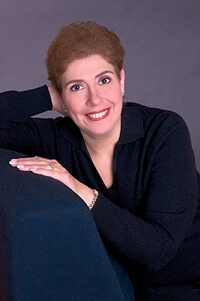 Andrea Kane is the New York Times and USA Today bestselling author of twenty-eight novels, including fourteen psychological thrillers and fourteen historical romantic suspense titles. With her signature style, Kane creates unforgettable characters and confronts them with life-threatening danger. As a master of suspense, she weaves them into exciting, carefully-researched stories, pushing them to the edgeâand keeping her readers up all night. Kaneâs first contemporary suspense thriller, Run for Your Life, became an instant New York Times bestseller. She followed with a string of bestselling psychological thrillers including No Way Out, Twisted, and Drawn in Blood. Her latest in the highly successful Forensic Instincts series, Dead in a Week, adds the Zermatt Group into the mixâa covert team of former military and spy agency operatives. With a week to save a young woman from ruthless kidnappers, this globe-spanning chase, from the beerhalls of Germany, to the tech gardens of California, to the skyscrapers of China, and finally the farmlands of Croatia will keep readers guessing until the very end. The first showcase of Forensic Instinctsâ talents came with the New York Times bestseller, The Girl Who Disappeared Twice, followed by The Line Between Here and Gone, The Stranger You Know, The Silence that Speaks, The Murder That Never Was, and A Face to Die For. Kaneâs beloved historical romantic suspense novels include My Heartâs Desire, Samantha, The Last Duke, and Wishes in the Wind. Kane lives in New Jersey with her husband and family. Sheâs an avid crossword puzzle solver and a diehard Yankees fan. Otherwise, sheâs either writing or playing with her Pomeranian, Mischief, who does his best to keep her from writing. 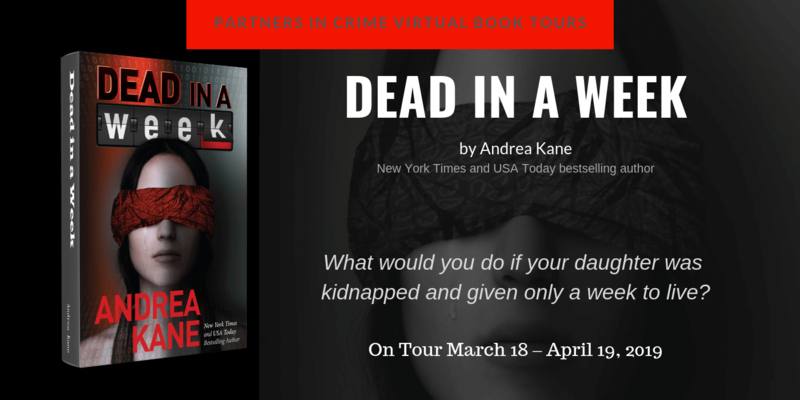 Thank you to Andrea Kane, Bonnie Meadow, and Partners in Crime Virtual Book Tours for generously offering this book to me for review. I had trouble putting this book down but then I do with all of Andrea Kane’s books. I apologize to your family for taking you away from them, but I’m so glad you loved DEAD IN A WEEK! 🙂 And my mouth is watering over that steakhouse, too!